This free vintage knitting pattern is an excerpt from the Beeton Book of Needlework, first published in 1870. Perfect for costume dramas, plays – or evenings when it’s too warm for a coat and too cold for bare shoulders. 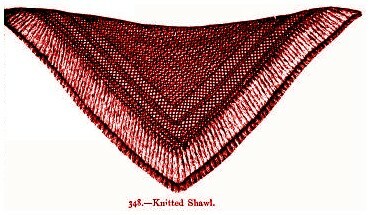 This shawl is knitted in the patterns given on Illustration Nos. 346 and 347. Both illustrations show the patterns worked in coarse wool, so as to be clearer. Begin the shawl, which is square, on one side, cast on a sufficient number of stitches (on our pattern 290); the needles must not be too fine, as the work should be loose and elastic. 2nd row: Knit 1 and purl 1 in the stitch formed by throwing the wool forward in the preceding row; the other stitches are purled. In the next row the holes are alternated–that is, after the 1st slipped stitch knit 1, throw the wool forward, and then knit twice 2 together. When 3 such open-work rows are completed, knit 1 row plain, and then  work the pattern seen on No. 347, which forms the ground, and is worked in the following way:–1st row: Slip the 1st stitch, alternately throw the wool forward, and decrease by slipping 1 stitch, knitting the next, and drawing the slip stitch over the knitted one. Does anyone know how to knit or crochet the shawl worn on The light between two oceans. She wore a Victorian old fashion shawl at beginning of movie. The picnic scene.